Flatfoot is often a complex disorder, with diverse symptoms and varying degrees of deformity and disability. There are several types of flatfoot, all of which have one characteristic in common: partial or total collapse (loss) of the arch. Other characteristics shared by most types of flatfoot include toe drift, in which the toes and front part of the foot point outward. The heel tilts toward the outside and the ankle appears to turn in. A tight Achilles tendon, which causes the heel to lift off the ground earlier when walking and may make the problem worse, bunions and hammertoes may develop as a result of a flatfoot. Flexible flatfoot is one of the most common types of flatfoot. It typically begins in childhood or adolescence and continues into adulthood. It usually occurs in both feet and progresses in severity throughout the adult years. As the deformity worsens, the soft tissues (tendons and ligaments) of the arch may stretch or tear and can become inflamed. The term “flexible” means that while the foot is flat when standing (weightbearing), the arch returns when not standing. In diagnosing flatfoot, the foot and ankle surgeon examines the foot and observes how it looks when you stand and sit. X-rays are usually taken to determine the disorder's severity. If you are diagnosed with flexible flatfoot, but you do not have any symptoms, your surgeon will explain what you might expect in the future. Immobilization. In some cases, it may be necessary to use a walking cast or to completely avoid weightbearing. Ankle Foot Orthoses (AFO) devices. Your foot and ankle surgeon may recommend advanced bracing to modify your walking and to support your arches. In some patients whose pain is not adequately relieved by other treatments, surgery may be considered. 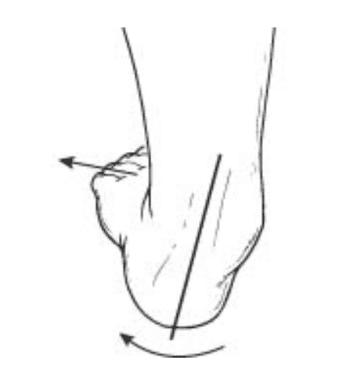 Many surgical techniques are available to correct flexible flatfoot, and one or a combination of procedures may be required to relieve the symptoms and improve foot function. In selecting the procedure or combination of procedures for your particular case, the foot and ankle surgeon will take into consideration the extent of your deformity based on the x-ray findings, your age, your activity level and other factors. The length of the recovery period will vary depending on the procedure or procedures performed. PTTD is often called adult acquired flatfoot because it is the most common type of flatfoot developed during adulthood. Although this condition typically occurs in only one foot, some people may develop it in both feet. PTTD is usually progressive, which means it will keep getting worse, especially if it is not treated early. 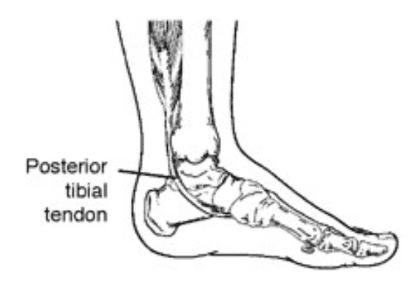 Overuse of the posterior tibial tendon is often the cause of PTTD. In fact, the symptoms usually occur after activities that involve the tendon, such as running, walking, hiking or climbing stairs. 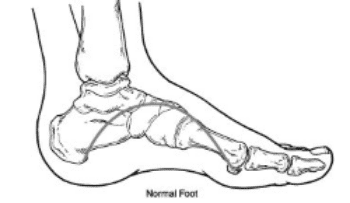 The symptoms of PTTD may include pain, swelling, a flattening of the arch and an inward rolling of the ankle. As the condition progresses, the symptoms will change. For example, when PTTD initially develops, there is pain on the inside of the foot and ankle (along the course of the tendon). In addition, the area may be red, warm and swollen. Later, as the arch begins to flatten, there may still be pain on the inside of the foot and ankle. But at this point, the foot and toes begin to turn outward and the ankle rolls inward. 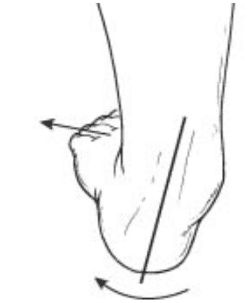 As PTTD becomes more advanced, the arch flattens even more and the pain often shifts to the outside of the foot, below the ankle. The tendon has deteriorated considerably, and arthritis often develops in the foot. In more severe cases, arthritis may also develop in the ankle. Because of the progressive nature of PTTD, early treatment is advised. If treated early enough, your symptoms may resolve without the need for surgery, and progression of your condition can be arrested. In contrast, untreated PTTD could leave you with an extremely flat foot, painful arthritis in the foot and ankle and increasing limitations on walking, running or other activities. In cases of PTTD that have progressed substantially or have failed to improve with nonsurgical treatment, surgery may be required. For some advanced cases, surgery may be the only option. Dr. Cottom will determine the best approach for you.